Heat oven to 350°F (325°F for dark or nonstick pans). Place paper baking cup in each of 12 regular-size muffin cups. Make cupcake mix as directed on box, using water, oil and eggs. Fill muffin cups one-third full with batter, using about 2 tablespoons in each. Squeeze filling pouch 20 times; cut off corner of pouch at cut line. Divide filling evenly among cupcakes, making sure filling does not touch sides of muffin cups. Evenly distribute remaining batter among cupcakes, making sure filling is completely covered. Bake 24 minutes or until surface of cupcakes appears dry. Cool 20 minutes; remove cupcakes from pan to cooling rack. Cool completely, about 30 minutes. In medium bowl, stir food color into frosting until bright yellow; spoon into decorating bag fitted with #802 or #6 round tip. Starting at 12 o’clock on outer edge of each cupcake and using constant pressure on bag, pipe frosting clockwise for 6 or 7 rotations, working toward center and ending in tall peak. 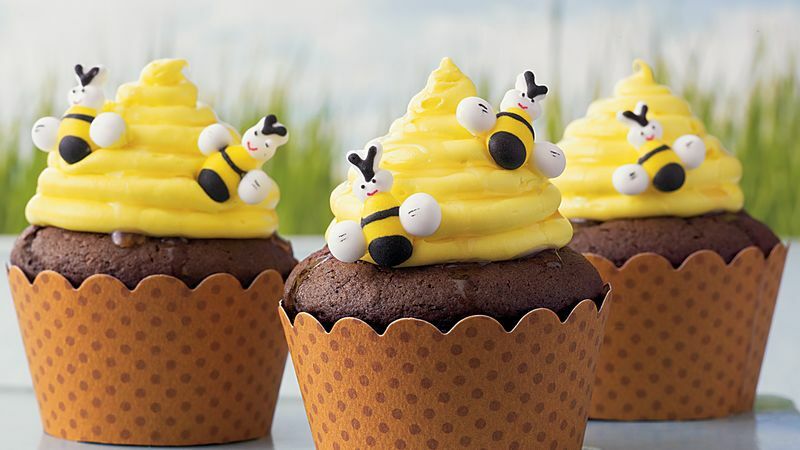 Decorate with honeybees and drizzle with honey.